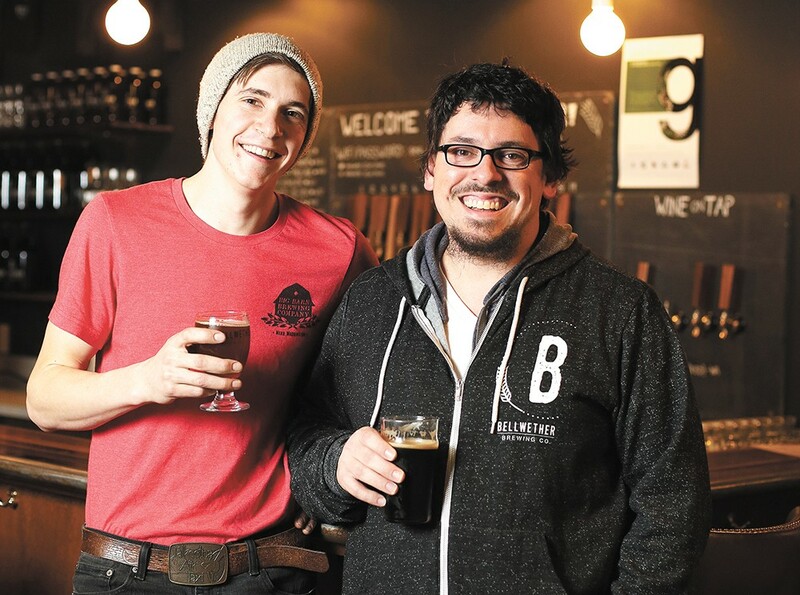 Big Barn Brewing's Eli Deitz (left) and Bellwether Brewing's Thomas Croskrey are both experimenting with no-hop beers. It's hard to say exactly what beers brewed hundreds of years ago would have tasted like to our discerning, modern palates, but we do know with certainty that most of these old-timey ales were missing one very familiar ingredient: hops. Instead, ancient European gruitbiers (pronounced "groot-beer") were flavored and bittered with naturally occurring herbs: yarrow, bog myrtle, rosemary, juniper, heather, mugwort and other plants. The name "gruit" comes from the German word for herb, grut. Historically, gruit ales widely fell out of favor in the 1500s following the passing of Germany's purity law, the Reinheitsgebot, which stated that beer could only be made from water, barley and hops. Yet, thanks of a growing event now in its fifth year — International Gruit Day is observed annually on February 1 — gruit-style beers are being reintroduced by craft breweries across the U.S. In Spokane, the city's first ever Gruit Day celebration is being organized by Bellwether Brewing Co., with participation from brewers at Young Buck, Republic, Iron Goat, Big Barn and Whistle Punk breweries. Local beer lovers can sample hop-free beers from each of the participating breweries, as well as a collaborative ale named "We are Gruit" (it's indeed a reference to Marvel's Guardians of the Galaxy) created by brewers with Bellwether, Whistle Punk, Republic and Young Buck. The amber ale released that day is flavored with a mix of wormwood, lemon verbena, yarrow, lemongrass, smoked chili flake, rosemary, heather, horehound and spruce tips. "The West Coast, and the Northwest, is known for its big hop bombs, and gruit ale is the quintessential opposite," remarks event organizer and Bellwether co-owner Thomas Croskrey. "In some ways, though, you could say they are similar. I've made a couple [gruit ales] that are so extreme. It was mostly IPA lovers who liked them, because the flavor was so extreme." The Albion Ale, a gruit style beer available at Bellwether. 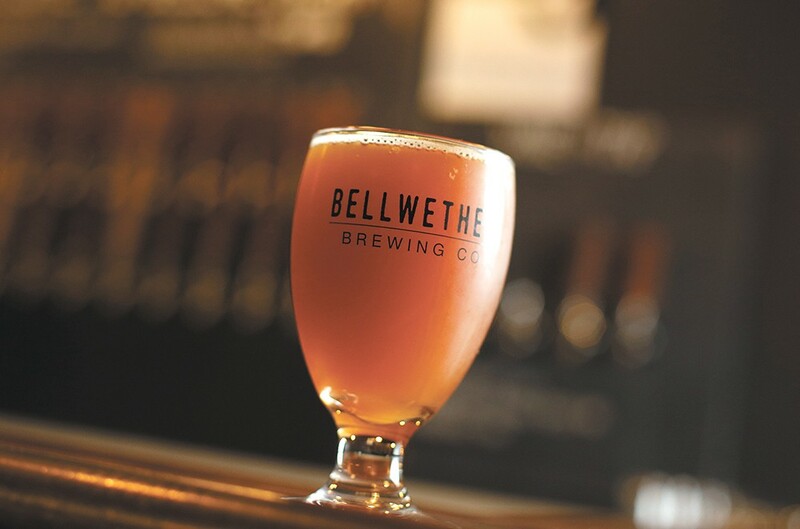 At Bellwether, Croskrey and co-owner Dave Musser have made it their goal to introduce regional beer drinkers to a range of lesser-known, old-world brewing styles. Among the more traditional offerings currently on Bellwether's 19 tap handles is their winter seasonal gruit, called Ancestry Ale. It's brewed with elderberry and presents a sour-like flavor profile, although it's not, by definition, a true bacteria-fermented sour beer. There's also an ancient Celtic-style sour brewed with heather, named Albion, and several braggots — a Nordic style, made with honey, that's similar to mead. Coming up with his own versions of these old-world beers began as an unintentional discovery for Bellwether brewmaster Croskrey. The self-proclaimed historical fiction nerd began experimenting as a homebrewer years back partly because he wanted to recreate some of the beers he was reading about, like braggots. "I was using things in my garden, and later when I started studying more, I learned that was how they made beer hundreds of years ago," he says. A true gruit beer can be flavored with one specific ingredient, or a mixture of herbs and spices, Croskrey explains. Many herbs used in the early days also served as a preserving agent. (One of the reasons for the move away from gruits, however, is because hops offer better stabilization, extending beer's shelf life.) In some regions, medieval towns would have had a "gruitmaster" who was responsible for mixing together herbs and spices to then sell to brewers, he adds. "The brewer would get it and sometimes not know what was in it," he says. "It was very proprietary, and brewers in Germany would have had totally different gruit than in, say, Scotland or Norway." The historical, region-specific use of varying blends of herbs and spices to flavor gruit ales offers major appeal to modern craft breweries, Croskrey says. "A lot of people are trying to do foraging beers, and locally farmed ingredients. For Spokane, if I wanted to make a gruit to represent the Northwest, I might collect some spruce needles and rose hips," he says. International Gruit Day was spearheaded in 2013 by Beau's Brewing Co. in Ontario, Canada. Dozens of breweries have participated with their own events and special releases over the years, but none in the Inland Northwest, to the best of Croskrey's knowledge. Since he'd already been experimenting with gruit at Bellwether, the brewmaster reached out to see if any other breweries would be interested in organizing an event highlighting the style, for local breweries making their own gruit recipes or interested in testing one out.